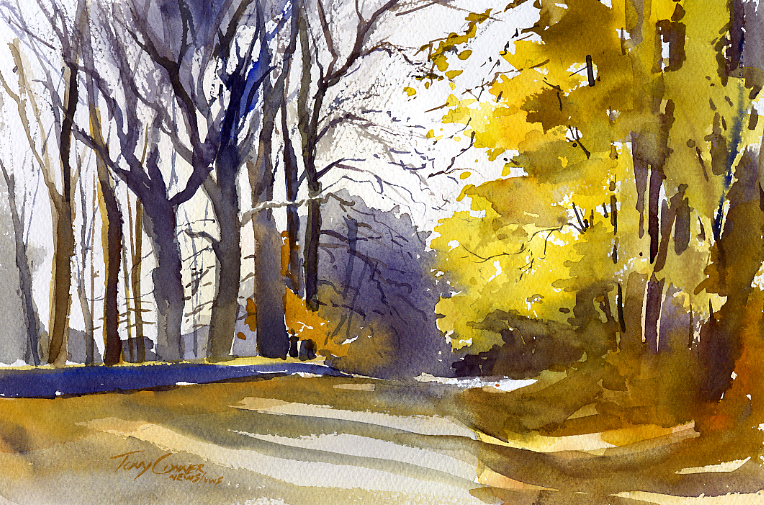 “The Last Glow” – watercolor landscape painting on paper, 7 1/2″ x 11″. I’ve begun a new series of landscape paintings focused on my home state of Vermont and the stunning beauty to be found in all of it’s season. This work is the most recent in that series. It was done “en plein air” (actually “du siège avant” – from the front seat!) on one of those late fall afternoons that radiate calm, simple and subtle beauty. 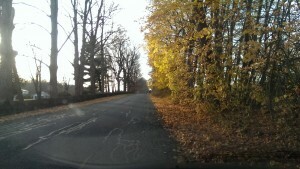 The scene is along West Road in North Bennington, Vermont – along the grounds of Park-McCullough mansion. 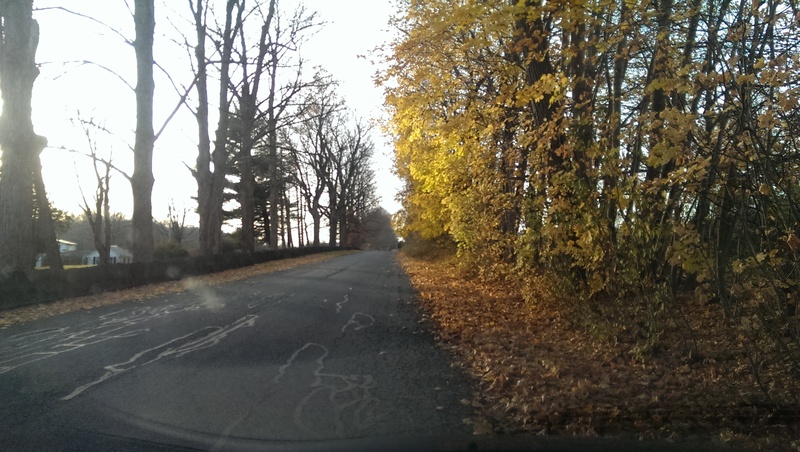 The contrast of brilliant yellow leaves on one side of the road with the completely bare trees on the other side was the main attraction. Weak, fading sunlight filtered through clouds and the branches of the bare trees to highlight the bright foliage on the right. Even so, the weak and transparent shadows are revealing of November sunlight and had to be included, to accomplish a real sense of time and place. 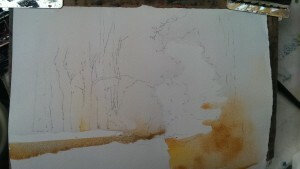 Here’s a photo of the scene just as I began painting. The sky was very light with a warm golden glow. Given the time of year, it’s not surprising that there was a lot of gray and brown in the scene as well. The initial step in any painting does not actually involve any painting at all. The initial step is to take in the scene itself and really focus on what you see and what is one thing that is attracting you to the scene. Without being clear about that, the painting is likely to have no focus, or worse, too many points of focus. For me, the main attraction was the brilliant yellow, sunlit foliage on the right side of the road. These would be the focus of the painting. 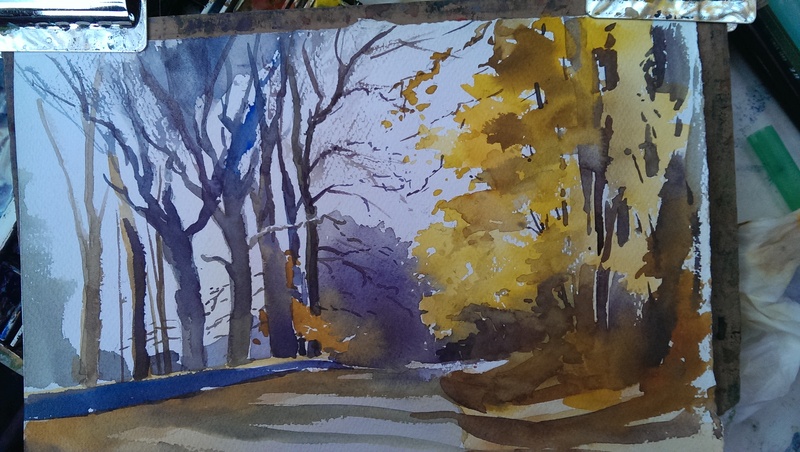 The bare trees on the left side would play two roles – one would be to provide visual contrast to the foliage, the other role would be to provide sense of time and place. The light shadows cast on the ground were also an important element in establishing time, specifically, time of year. 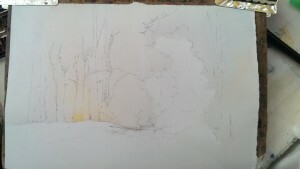 In most of my paintings, the pencil layout is minimal. It is my preference to do most of the work with my brush so the underlying pencil drawing is only to help establish major shapes and the relationships between them. The trees on the left are the most detailed, yet for each, only the major trunk shapes are drawn. There is no detail in the canopy at all. On the right, the masses of brilliant leaves are indicated with large shapes – no details at all. The road is added with a couple more or less straight lines. Same for the leaf covered grass shoulders and the stone wall on the left. As mentioned, the sky was glowing with a very light golden color. Three colors were used in the sky – cadmium red, cadmium yellow and cobalt blue. 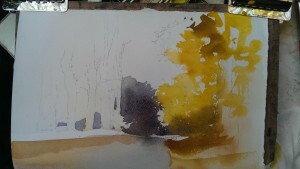 Using this triad of primary colors in a loose flowing wash created a the warm, light glow. Visually, the use of more than color in a wash that allows them to freely mix is more interesting and happens to be more visually believable than would be the case if a single color was used. The primary triad of cadmium red, cadmium yellow and cobalt blue would serve as the basis for the painting. In fact, only six colors were used to create this painting – the red, yellow and blue already mentioned along with lemon yellow, raw sienna and burnt sienna. The use of a limited palette in any painting provides a great deal of both harmony and unity. Next came the initial washes for the shoulders of the road, then the road itself, along with the distant greys that represent a distant wooded area. As with the sky, these areas were dropped in as very fluid washes that contained several colors. As with the sky, this free inter-mingling is both visually interesting and believable. 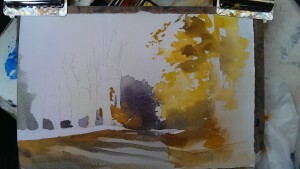 Next up was the bright foliage to the right. Since this is the focal point of the painting, it was important to get this in right. The first thing to know is that large masses of foliage like this is best done as one large shape – even though these leaves were attached to a number of different trees. 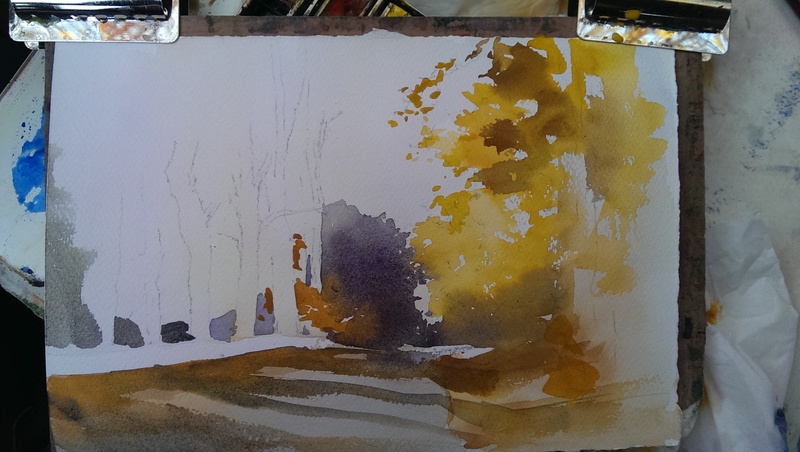 With masses of leaves, particularly leaves on autumn trees, it is important to indicate ‘holes’ in the foliage – where one can see through to the background or the sky, along with a rough edge that has some of the same character as a scribble. In fact, the brushwork for this passage is somewhat of a scribble as all parts of the brush get used to place color. 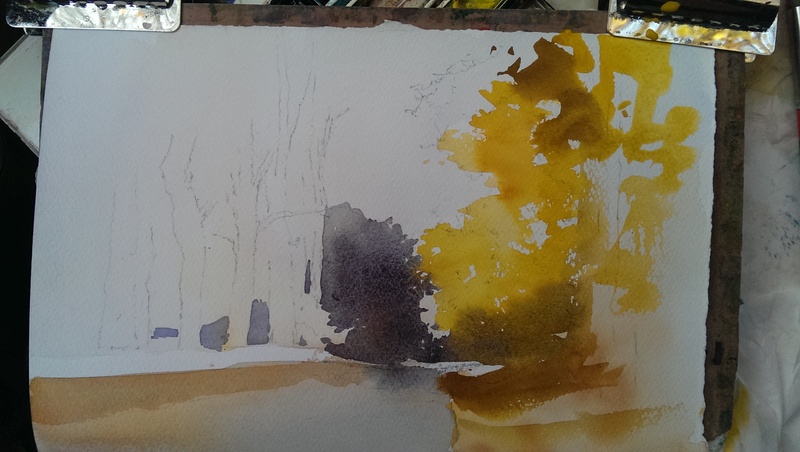 With the main bright yellow color in, again, a wet and free-flowing wash, some additional color is added – another yellow for variety and some cobalt blue to create cooler areas that indicate foliage in shade. 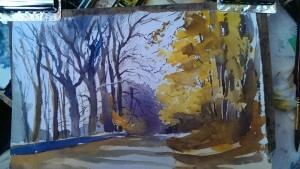 Next, to start developing the sense of time, the shadows were added to the road. Again, these are loose and flowing mingling of several colors – cobalt blue is the main color, but there is also cadmium red and burnt sienna in these washes. A small, but important, burnt orange shape is added in the middle ground area. This is an important counter balance to the large foliage shape on the right. This shape provides a visual bridge across the road. It imitates the main focal point and provides an intense warm color among what will be the relatively cool hues of the bare trees. At this point, the painting is more than halfway done. 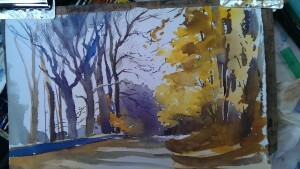 The only area that is really left to be done is that on the left, which includes the bare trees and their canopies. This is an area that can easily be overworked and overdone by getting caught up in all the details. By treating the area simply and making marks that just indicate complexity, it is possible to avoid and overworked look while achieving a believable reality. One thing to notice first is that the trunks of these large trees are not telephone pole straight. Most trees aren’t so drawing and painting them this way is important in creating an image of reality. The trunks are, again, free mingling of several colors. The stone wall, to the left, is a very dark grey color in reality. 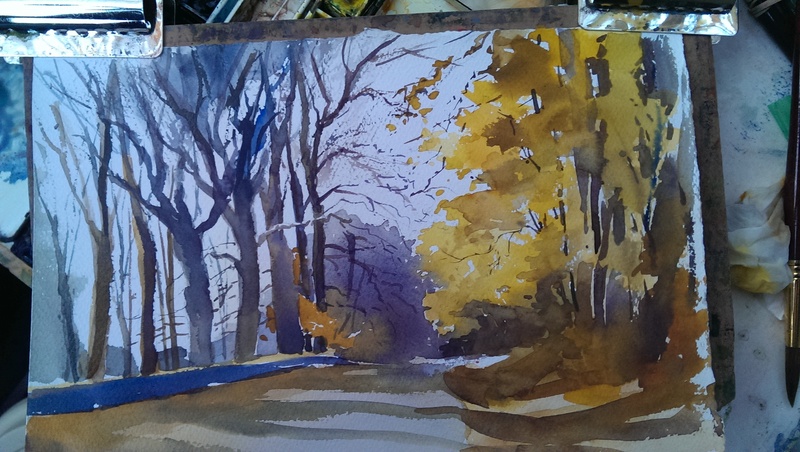 For this painting, the decision was to apply a stroke of relatively intense blue, to help balance the intensity of the yellows on the right. To this point, the painting has been done using a single brush – a #14 Loew-Cornell Ultraround, It is one of my favorite brushes because of its firm touch and great point. The smaller branches on the bare trees are done with two ‘rigger’ brushes, one smaller than the other. The canopies of the bare trees actually consist of many smaller branches. It is not practical, even if it were a good idea, to paint each of these branches and twigs. Instead, applications of light greys and areas of drybrushed grey color, visually substitute for all of that impossible to re-create detail. At this point, all that’s left is to put in the final touches of paint, here and there and it’s all done. This painting is titled “The Last Glow” and is one of the paintings from the “Light & Landscape: The Vermont Experience” series. 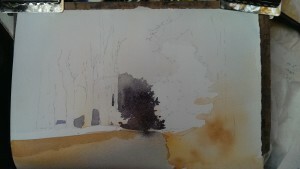 A new plein air landscape painting featuring a scene from Vermont is posted every few days. If you are interested in seeing each painting as it is released, use the form to the left to sign up for the email list. Be sure to check the “New Paintings” box.